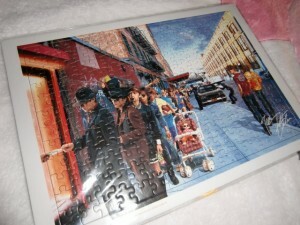 B’Z promotional puzzle. Extremely limited edition puzzle which was only included with their “The Best Pleasure” best of album release. Puzzle came in 2 versions with the alternate “side shot” version being much more common as it was sold directly with the LE album release, the puzzle photographed for this auction was sent to select record stored only in limited quantities and given away at the retailers discretion as a first come first serve basis. Puzzle is in assembled form and sealed in plastic but can be taken apart of course…..if one would like to bet a headache trying to put it back together :P. I’m so bad at puzzles!!! New, never opened. Measures approximately: 14 1/4″x 10 1/4″. Gosh is there any popularity or sales record that the J~rock legendary B’z haven’t held at one time or another?! And to appease their legions of dedicated fans, in the Summer~Fall of 98’ the B’z released two consecutive mega~hit best of albums♥ the first of which included a LE first press puzzle (unassembled in an outer box) which remains as one of the more unique and creative extra goods I’ve yet seen to date and even rarer is the assembled puzzle photographed above which depicts a wonderfully colorful collage where the guys themselves appear in an array of walks of life. The puzzle version included with the first press editions of “B’z The Best Pleasure” depicts a side view while this version depicts a “straight~ahead” view and this assembled puzzle (not glued though, you can take it apart and drive your brain wacky to enjoyment’s extent putting it back together! !….lol I’m notably terrible at puzzles….see SPEED post :P) comes packaged as a display piece housed against a thick cardboard and protected by an outer re~sealable plastic. The puzzle measures approximately 14 1/4” x 10 1/4” and is newly sealed, never opened! A wonderful and most rare collectible for any B’z fan and stylish and well made enough for framing =). This puzzle extra was only shipped to select record stores in highly limited quantities and physically handed out to fans in~store for first album purchasers making it most rare~!